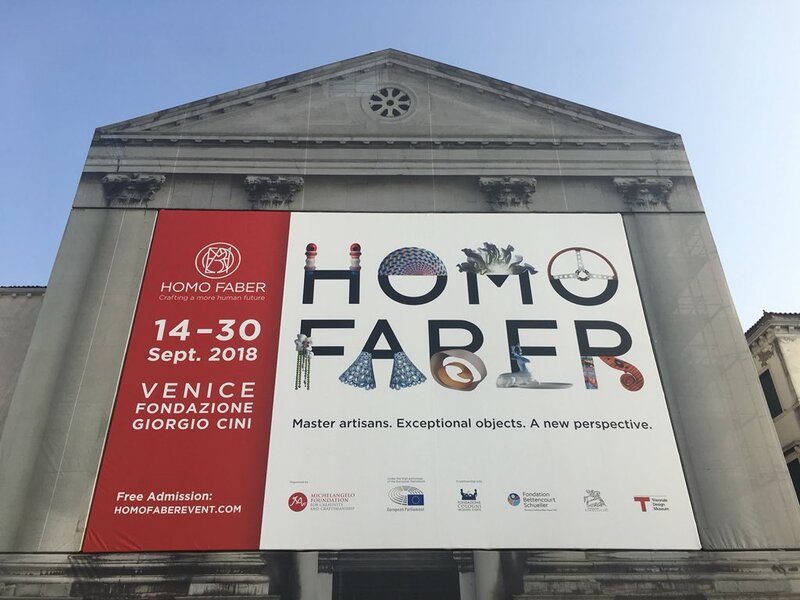 Taking place from 14 to 30 September in Venice, Homo Faber: Crafting a more human future was a unique display of more than 900 objects celebrating the work of some 400 top master artisans and designers from Europe held at Fondazione Giorgio Cini. This unprecedented immersive exhibition is an initiative of the Michelangelo Foundation for Creativity and Craftsmanship, in partnership with the Fondazione Cologni Mestieri d’Arte – both member organisations of Europa Nostra -, the Fondation Bettencourt Schueller, the Fondazione Giorgio Cini, the Triennale di Milano Design Museum, and placed under the high patronage of the European Parliament. Europa Nostra had the opportunity to participate in the exhibition vernissage and a full-day conference, thus building bridges between heritage and craftsmanship and strengthening its cooperation with the world of foundations. On 12 September, the Michelangelo Foundation’s founders Johann Rupert and Franco Cologni officially launched Homo Faber during an opening ceremony attended by Europa Nostra’s Secretary General Sneska Quaedvlieg-Mihailovic and Board Member Rossana Bettinelli. Luigi Brugnaro, the Mayor of Venice, and Giovanni Bazoli, the President of the Fondazione Giorgio Cini, joined them to cut the ribbon and unveil the finest of European craftsmanship for a 2-week free event. In his powerful and visionary opening speech, Johann Rupert, also Chairman of Switzerland-based luxury group Richemont, reminded that craftsmanship is a sector where Europeans are still able to compete against machines, and stated that “Destiny of fine craftsmanship is in our hands. Join our movement to design – against all odds – a future which is more human”. Participants were then able to visit the fascinating 16 exhibition spaces imagined by renowned curators showcasing rare traditional skills that are threatened of being extinct, mixed with innovative contemporary techniques. On display were fine craftsmanship objects, photographs, films, VR experiences, but also artisans showing their working techniques to visitors, thus bearing witness to the value of the human hand. On 24-25 September, Europa Nostra’s Board Member Rossana Bettinelli together with member of staff Manon Richard had the opportunity to attend 2 days of conference and visits of Homo Faber specially organised for the Michelangelo Foundation’s network, during which Europa Nostra got more acquainted with the close connection between crafts and heritage. The discussions and debates revolved around three key themes for the safeguarding and enhancement and craftsmanship in Europe. The first panel focusing on “Evaluating craftsmanship” gathered Louise Allen, President of the World Crafts Council Europe, Alberto Cavalli, Director of Fondazione Cologni, Gérard Desquand, Maître d’art and former President of Institut National des Métiers d’Art and Ieva Skaurone, Head of the Monumental Art Department of Vilnius Academy of Arts. They exchanged on the importance of developing evaluation schemes to elevate the status of artisans, sustain the diversity of their skills and increase the interest of the younger generation. 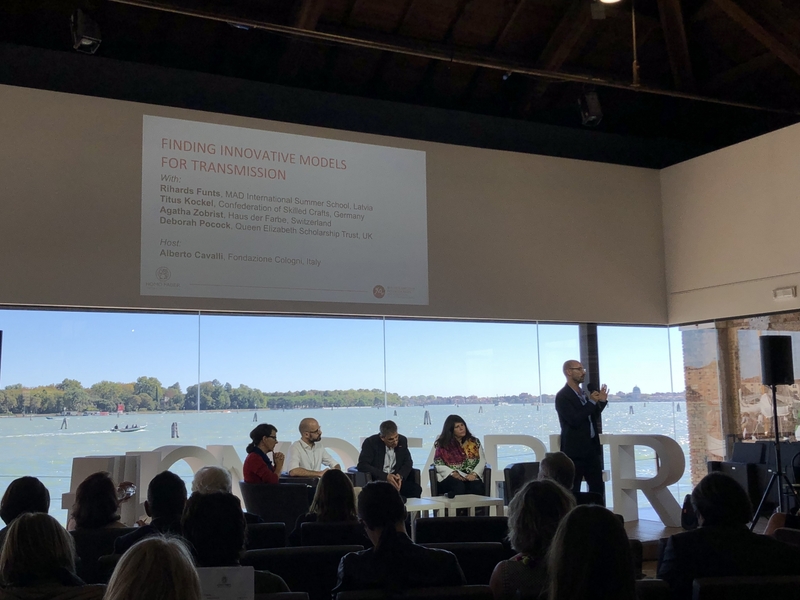 During the second session dedicated to “Finding Innovative Models for Transmission”, speakers Rihards Funts, Designer and Director of MAD International Summer School, Titus Kockel, Head of Unit, Promotion of the Trades, at German Confederation of Skilled Crafts and Small Businesses, Deborah Pocock, Executive Director of Queen Elisabeth Scholarship Trust, and Agatha Zobrist, Director of Haus der Farbe, presented how they work to ensure the two-way exchange of knowledge between master artisans and students, and how to lift up the status of young people studying crafts and design. At last, the third panel engaged Josianne Giammarinaro, Director of Ecole Boulle, Romain Juilha, Project Manager Art, Culture and Creation at Atelier Art de France, Zsolt József Simon, Ceremicist, Nadine Visher-Klein, Chairwoman of Tresor Contemporary Craft and Paolo Ferrarini, Journalist at Cool Hunting, who gave concrete examples of how they communicate about craftsmanship, the tools and strategy they use to make it appealing especially to the younger generations. For instance, Romain Juilha presented a promotional video of Empreintes, a French craft concept store, Zsolt József Simon explained how sharing his works through social media uplifted his career, and Paolo Ferrarini showed the most successful articles about craftsmanship featured on the online publication Cool Hunting. Europa Nostra recognises and praises the impressive work of the Michelangelo Foundation and its partners to create such a complete event in celebration of the best of European craftsmanship with an emphasis on its future – combining exceptional objects, artisans at work, passionating talks, and involvement of the young generation through the Young Ambassadors programme. Europa Nostra stands ready to cooperate with the Michelangelo Foundation and its partners to advocate the value of craftsmanship and the need for its safeguard and enhancement through relevant European and national policies. Stay tuned for the next edition of Homo Faber which is supposed to take place in 2020!